Your guide to custom printed table runners, covers, and tablecloths to energize your next event. Trade shows and events are the place where your company can make a statement. With hundreds, even thousands of attendees, you have the opportunity to pick up many new clients. The only issue you have to overcome is competition. These events are full of vendors. There are hundreds of other booths, all competing for the attention of those in attendance. As such, it can be difficult to get the attention of those in attendance. Still, these events are necessary as they present opportunities for your company to reach out to a large audience filled with potential clients. While a focus on providing valuable and effective promotional gear is important, we must not overlook one crucial item. Successful use of promotional items relies heavily on the ability to attract people to your booth. So how do you get the attention of those in attendance? To get the attention of those passing by, you must stand out from all the others. One way to do that is to be easily recognizable by those who are already familiar with your brand. In addition, you need to make a statement for those who don’t already know who you are. This may sound difficult, particularly when competing head to head with rival brands. It requires creative thinking, strategic branding, and a lot of hard work. However, one of the best ways to do this is with a custom tablecloth that displays your company logo. If you have ever attended a trade show of any kind, you probably already know where this is going. Chances are that nearly every booth had a custom tablecloth adorning their station. While it seems simple, the importance of a trade show tablecloth cannot be overstated. Similar to a billboard advertisement on the side of a busy highway, branded tablecloths serve as a first point of contact to passersby. No matter how great your company is, you are no good if you can’t attract attention. First impressions matter, and a great tablecloth tips the scales in your favor. Communicate a message: in one glance, what do you want to say to prospective clients? Accomplishing these tasks is the difference between great brand exposure or becoming part of the “background noise” at busy tradeshows. Take the initiative with the important first step of a custom table cover. Work with our team of professionals to help you select the appropriate tablecloth for your next event! Choose from over 70 customizable options available on our website. Read on and discover what we can bring to the table for you. And yes, pun absolutely intended! For a simple, yet professional look, we have a full lineup of custom table runners for any occasion. Table runners are a proven and cost effective way to step up any display. Keep in mind they look great when paired with existing tablecloths. This allows for a level of creativity and customization, without the need to purchase more than one customized table runner. To change up your look, simply place a different color of standard tablecloth beneath a company logo tablecloth. By doing this, you can have a different look without the need to purchase multiple custom tablecloths. Standard runners work seamlessly with solid color or repeating design tablecloths, placing your logo front and center against a backdrop. If you want to use an already customized table cover, use a lateral style runner to leave the front of that tablecloth exposed. All of our runners are designed for use with standard size, rectangular “banquet” style folding tables. They are available in several materials including flame retardant polyester poplin and satin. Most are available to ship in one week or less. 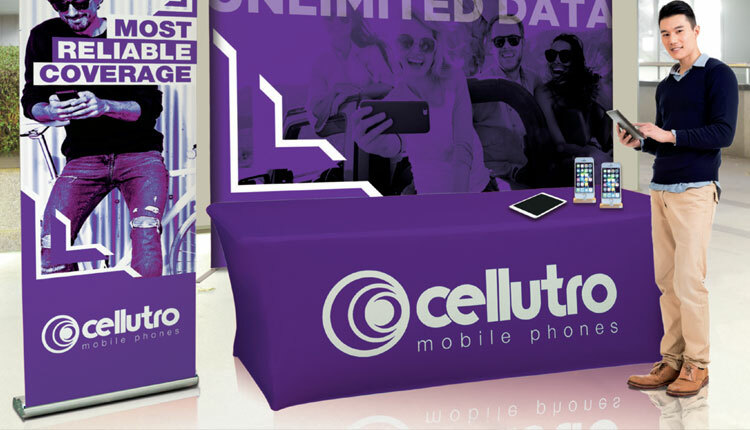 If you prefer a one-piece table cover and branded message, choose from our variety of custom, full-sized tablecloths. Our standard throws incorporate a traditional hanging style table cover with your personalized design. These full size tablecloths are designed for complete coverage of the most common size rectangular and round tables. Coverings will conceal all open sides of the table for a clean and professional look. Choose between a single front-facing logo, or multiple logos for the top or both sides of the table. Alternatively, mix and match with our custom table runners for a unique collaboration. Searching for something a little bit less traditional? Fitted throws are a slick looking alternative to the standard table coverings we are accustomed to seeing. In contrast with a normal tablecloth, fitted coverings are constructed from form-fitting materials that create a smoother appearance. As such, this eliminates seams and wrinkles traditionally seen in the corners. Round tables with a fitted covering do not have the familiar pleats associated with round tablecloths. Because of this, the polished, more modern appearance can help set your booth apart. Each of these styles give your presentation a little twist compared to the traditional hanging style tablecloths. Also note that you can work with our team for help find the right match-up for your brand’s goals. Some messages call for a polished, professional appearance that reinforces your brand’s ideals. Other companies are looking for zany, over-the-top looks that catch someone’s eye and peaks their interest. Which one are you? As with our traditional custom tablecloths, fitted throws are available for common sizes of both round and rectangular banquet tables. Because of this, you can take your pick from fully customized “blank canvas” styles, or solid color covers with designated imprint areas. As wonderful and necessary as they are, tradeshows pose unique challenges to brands and businesses. By their very nature, these events create an extremely competitive environment in which creativity and branding go a long way. Not only are you vying for attention of people surrounded by competing choices, but you often have just one glance to win people over. First, you can always take steps to help improve the success of your booth by deploying a stunning and attractive quality custom tablecloth. As such, you can successfully catch the eyes of a potential client and encourage them to seek more information about your brand. With our help, you can spruce up your next event with the simple, yet important step of investing in a custom table cover. Keep in mind, in an environment where you are not guaranteed a chance to speak to potential customers, visual cues are more important than ever. Speak with our product specialists today, and take this important first step to tradeshow success.